An essay on the autographic collections of the signers of the Declaration of Independence and of the Constitution : from vol. xth, Wisconsin Historical Society collections / by Lyman C. Draper. An Essay On The Autographic Collections Of The Signers Of The Declaration Of Independence And The Constitution [Lyman C. Draper] on Amazon.com. *FREE* shipping on qualifying offers. This scarce antiquarian book is a facsimile reprint of the original. Due to its age, it may contain imperfections such as marks. An Essay on the Autographic Collections of the Signers of the Declaration of Independence and of the Constitution | Lyman C. Draper | ISBN: 9781151470782 | Kostenloser Versand für alle Bücher mit Versand und Verkauf duch Amazon. 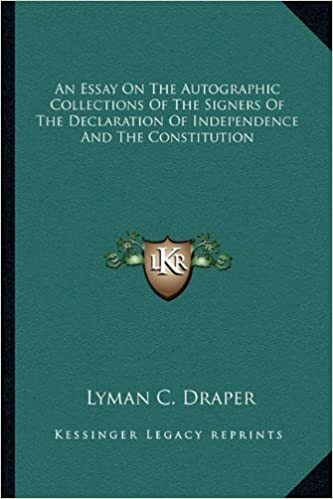 An Essay on the Autographic Collections of the Signers of the Declaration of Independence and of the Constitution (Classic Reprint) | Lyman Copeland Draper | ISBN: 9780260598066 | Kostenloser Versand für alle Bücher mit Versand und Verkauf duch Amazon.